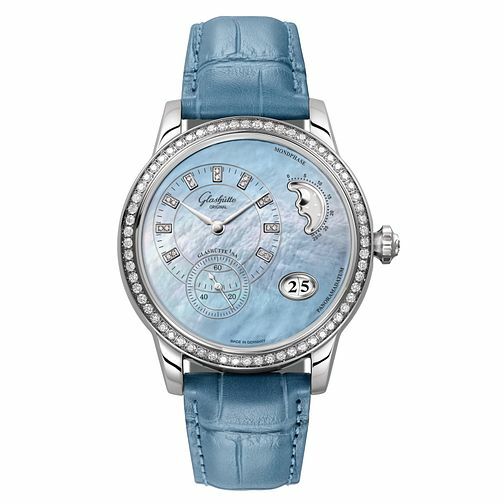 Glashutte demonstrates their mastery of watchmaking with this highly refined timepiece, showcasing a dream-like mother of pearl dial that resembles billowing clouds. The main clock hands and subdials are set with precious diamonds and are placed differently within the dial compared to most other watches. A unique moonphase also decorates the dial with added indices for even more exact measurement. The date aperture stands larger than most other watches, letting you monitor the day easily. The watch is finished with dazzling diamond set indices and a blue strap to watch the dial.